Ar FIM Eiropas un Tūrisma komisijas locekļu atbalstu Barselonā, Spānijā, 2018.gada 14.aprīlī, plānots organizēt jau otro Tūrisma Gidu apmācības kursu. Uz apmācību iespējams pieteikties līdz 2018.gada 11.martam. Detalizētāka informācija par apmācību kursu pieejama PDF failā. Ņemot vērā iepriekšējās apmācības kursu pozitīvos rezultātus, kad pēc Tūrisma gidu apmācības programmas beigšanas jaunie FIM Eiropas sertificētie Tūrisma gidi saņēma konkrētus darba piedāvājumus mototūrisma grupu vadīšanai, Iepriekšējās apmācības notika Honda Drošības Institūta motociklu poligonā, kas ir lieliska infrastruktūra, lai apmācibu dalībnieki apgūtu vai pilnveidotu savas braukšanas iemaņas un arī šoreiz ir pieņemts lēmums šīs apmācības organizēt Honda Drošības Institūtā. Apmācību dalībniekiem tiek piedāvāti gan atbilstoši motocikli (ceļa un bezceļa trasēm), gan arī aizsargu aprīkojums un ķiveres, kas ievērojami atvieglo ceļošanu uz Barcelonu. Šogad apmācības ietvaros arī plānots piesaistīt profesionālu sacensību mediķi, kas savā lekcijā izglītos dalībniekus pirmās palīdzības sniegšanas jautājumos, jo Tūrisma gida atbildības ietvaros ir rūpēties par visu ceļotāju drošību un nepieciešamības gadījumā snbiegt pirmo medicīnisko palīdzību. Pēc apmācību beigšanas Tūrisma gidi saņems FIM Eiropas sertifikātus, kas tiem ļaus organizēt mototūrisma braucienus, turklāt visi jaunie Tūrisma gidi tiks publicēti FIM Eiropas mājas lapā un kļūs starptautiski pozicionēti kā atzītie mototūrismu grupu vadītāji. We are pleased to announce you that, on proposal of the FIM Europe Touring Commission, we are launching the 2nd FIM Europe Moto-Tour Assistant Training Course, which will take place in Barcelona/ Spain on the 14th April 2018. The aforesaid Course, will be composed of a theoretical part (about 2,5 hours) and of a longer practical part (full programme enclosed). This time, towards the 1st edition of the Training Course, the theoretical part will include also first-aid notions. FIM Europe will cover all costs of this Course, training bikes & riding gear (on and off road), as well as lunch catering during the training day for all participants. Participants should have a proper footwear for the on-road riding courses as well as clothing such as jeans/slacks/long trousers in order to avoid minor injuries such us scratches or similar. Of course all other costs of travel, accommodation & meals, as well as any other not explicitly hereby mentioned, will be at charge of each participant. 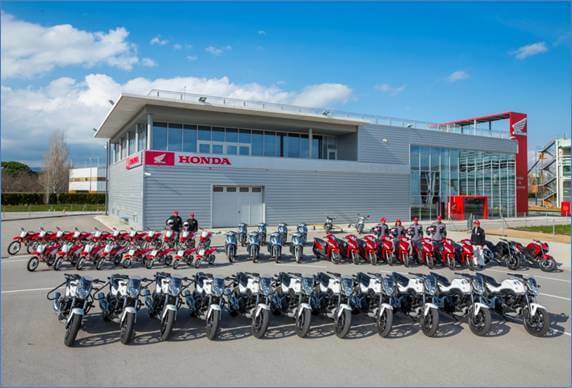 FIM Europe will organize and pay itself the transfers of all participants from\to the Honda Safety Institute. The exact time of the transfer will be communicated to the accepted candidates on a later stage. At the end of the Course, it will be organized also the transfer back from the Honda Safety Institute to the same hotel. (Of course the participants are not obliged to book their rooms at this hotel. It represents only the meeting point for the transfer). On successful completion of the Moto-Tour Assistant Training Course, the participants will receive a diploma, certifying that they are entitled to provide Moto-Tour Assistant Services. On the FIM Europe website will be also published the list of all participants having got the aforesaid certificate. The check-lists will be evaluated by the FIM Europe Touring Commission and, immediately afterwards, we will answer to all candidates in order to inform if they have been accepted. The training course will foresee a maximum of 15 participants.